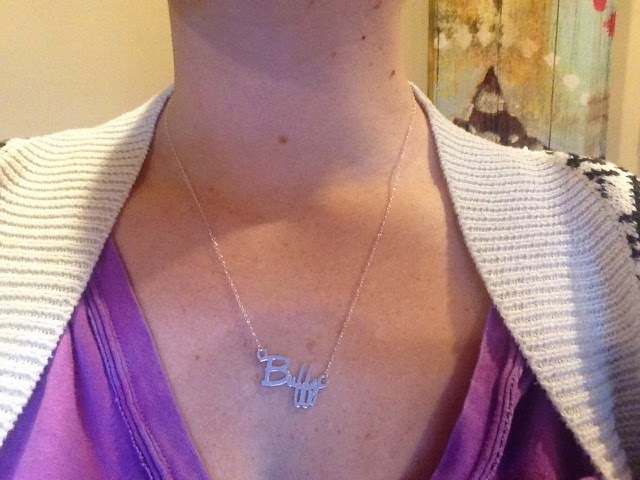 Daily Adventures of the SAHM: Let's talk about a gorgeous necklace with my name. Let's talk about a gorgeous necklace with my name. A while back I was given the opportunity to receive a free monogram necklace valued at around $70 in exchange for a review, from Monogram Online. 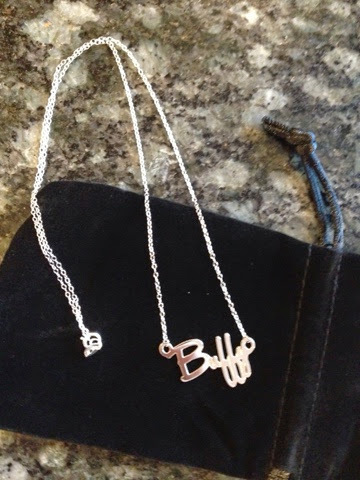 Obviously I jumped at the chance - who wouldn't love the chance for a lovely necklace with my name?! 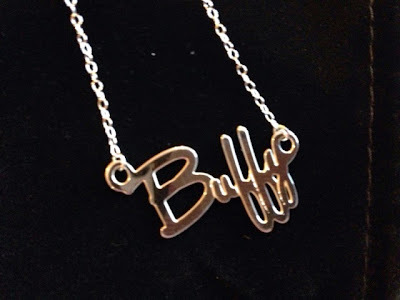 I'm sure you all would love to have a Buffy necklace. Obviously. I placed my order and promptly received a notification that it was in production. Several weeks later I received the necklace! It's lovely, really. Solid feeling, and would make a gorgeous gift. It even came with a sweet little velvet gift bag! The chain is delicate and simple, which is exactly what I love in jewelry. I'd say that my only critique is that the name is a little bigger than I was expecting, but when I busted out the ol' ruler it's pretty much on point. There are a gazillion options of necklaces and other monogrammed and custom jewelry to choose from, and would make SUCH a sweet gift for your special lady (or gent. Or kid. Or whatever). Go check out www.monogramonline.com! Buffy approved.